Home / animation / articles / CP / web animation / web animation watch / Web Animation Watch: 'Everyday Monsters', 'Crash Bandicoot Falls' and more! 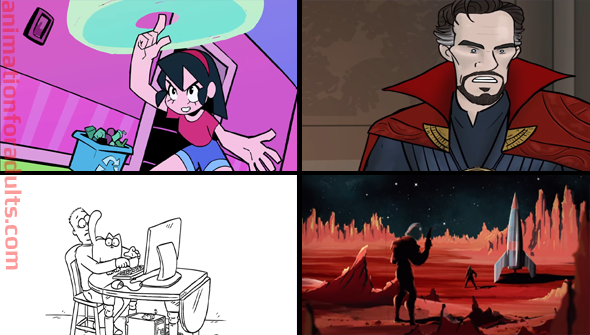 Web Animation Watch: 'Everyday Monsters', 'Crash Bandicoot Falls' and more! The internet opened up new possibilities for animators. It has never been easier for animators to get their stuff out there for a potentially huge audience to see. The only problem is.. with such a huge amount of material out there, how are you supposed to know what's worth your precious time? That's where our regular Web Animation Watch comes in. We trawl the internet to bring you the best stuff out there, old and new. Have you got something that you think we'd like to feature in a future edition? Drop us a line today! Firstly, we should point out that this isn't actually a brand new episode, but rather a compilation of some of the series' best moments. Using the smart premise of suggesting they all take place over the course of a single day, it charts the course of the day from being woken up in the morning, right through until the end of the day. It may not be new, but Simon's Cat is so well observed (and so irresistibly cute) we couldn't help but include it. If you've somehow got this far and never seen an episode (the series is one of the most popular on YouTube) then this is a wonderful place to start. It's also a great demonstration of how the animation on the series has evolved from the earliest episodes. Even from those earliest episodes, the genius formula was there- and the animation perfectly captured feline behaviour. With Marvel Studio's latest release coming to home video, here's How It Should Have Ended's take on the movie. HITSHE reliably brings some laughs and an effective animation style that generally does a decent job at bringing Hollywood stars to animated life.The best bit here is (as usual) the Superhero Cafe, where the Sorcerer gets to hang out with Batman and Superman- not something you're likely to see on screen for real anytime soon. Geeky fun. Christopher Johnson's short transforms everyday objects into fearsome beasties, that our lead characters must take on. It's a pretty simple, fun concept. The animation style is what really makes this sing, however. Bright, colourful and full of character, it has a look that is part western, part anime that reminds us of the original Scott Pilgrim comics. On the strength of this, it looks like Johnson is a talent to watch. You can see more background and making of material about the film at his Tumblr site. Mashed (owned by UK broadcaster Channel 4) is on a noble mission to mash-up all your favourite videogames with your other pop culture faves. But if anyone saw a Crash Bandicoot/ Gravity Falls mash-up coming, it certainly wasn't us. This takes the characters from the 90's Playstation classic and puts them in a pitch-perfect recreation of the Gravity Falls opening titles. Crazy idea, but somehow it works. This comes from writer/director Laura Rankin, and is animated by Tobias Knitt. Despite what it sounds like... Captain Kirk himself is not headed back into space. Instead, it's a nifty video of Mars facts- narrated by the Shatman and brought to life with mixed-media animation by the legendary Aardman Animations. Commissioned by BBC Radio 4 to celebrate their Martian season of programs, this boasts some fantastic retro pulp/ 50s B-movie styling.